I love drinking tea and green tea is one of my favourites! The scent makes me feel awake in the mornings and also I tend to love skincare products containing green tea a lot regarding their scent. 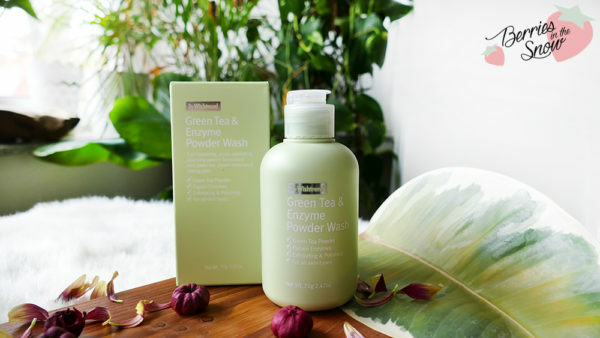 A new product from Wishtrend called By Wishtrend Green Tea & Enzyme Powder Wash has just launched and I am so happy to be able to report to you about my experiences on testing this product for the last weeks. Probably, you know that Wishtrend does not only sell other Korean brands but also has a step in the beauty industry itself. Apart from known brand names Klairs or Jungle Botanics they also have products named under the brand “By Wishtrend”. Well-known products from By Wishtrend are the Vitamin C 21.5 Advanced Serum, Natural Vitamin 21.5 Enhancing Vitamin Mask, or the Mandelic Acid 5% Skin Prep Water which I reviewed not long ago. 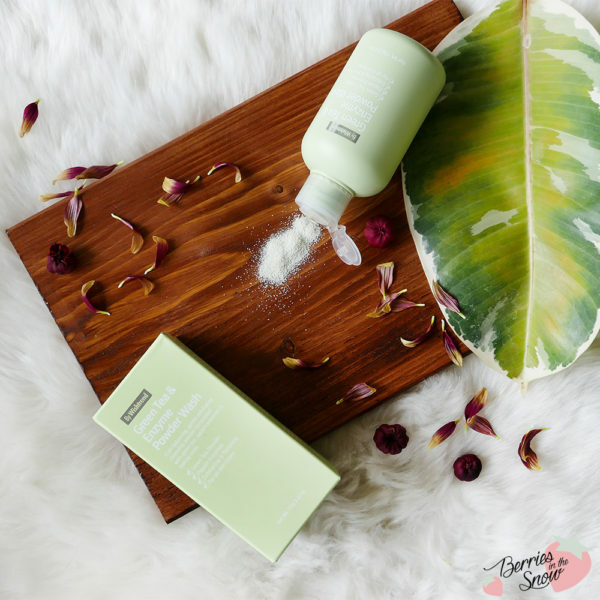 The latest addition to the By Wishtrend product family is the By Wishtrend Green Tea & Enzyme Powder Wash.
By Wishtrend Green Tea & Enzyme Powder Wash is a cleanser that comes in powder form. In order to make the product ready for cleansing your skin you have to add water or your favourite watery toner to the powder and lather it up. Powder Wash are probably one of my favourite cleansing types for travelling, since the product will never leak and create a mess during transportation if it breaks. 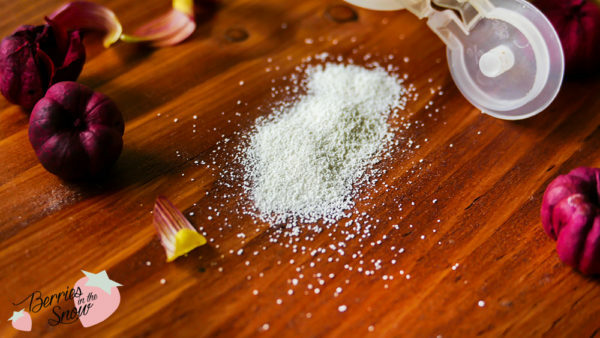 The powder wash comes in a pale green plastic bottle which makes it very lightweight and perfectly portable. The packaging is very simple and only shows the product name and some minor description on the backside. The cardboard box has the same green color and simple design, but it contains more thorough information on the sides in Korean and English. Green tea does not only have health benefits when consumed, but also has many benefits for the skin when applied topically. It contain polyphenols and Vitamins A,C, and E, which have anti-oxidant properties, and so it acts anti-aging and protects the skin from UV damage. Moreover, it also has moisturizing, soothing and smoothening properties on the skin. It is practically an all-rounder and has been used for many years in cosmetics products, especially in the asian region, where drinking green tea and tea in general is a major part of the culture. You can check the ingredients via COSDNA or Skincarisma to see what the single ingredients are for. The product is free from alcohol, paraben and sulphates. It has mainly brighteing, exfoliating and anti aging properties and is in generally suited for all skintypes, but it contains corn starch and citric acid. Corn starch can be irritating for acne-prone skintypes and citric acid has to be used with care for sensitive skintypes. I personally have dry skin and didn’t react in a negative way the Green Tea & Enzyme Powder Wash.
As I said before you have to mix this powder with lukewarm water (or your favourite toner) to lather it up. The Wishtrend description recommends lukewarm water to activate the enzyme properties of the cleanser. Also, it is recommended not to use AHAs/BHAs, highly concentrated Vitamin C, Retinol, etc. together with the product, because the cleanser already contains exfoliating ingredients and you do not want to over-exfoliate your skin. For sensitive skintypes it is recommended to use the cleanser only 2-3 times a week. 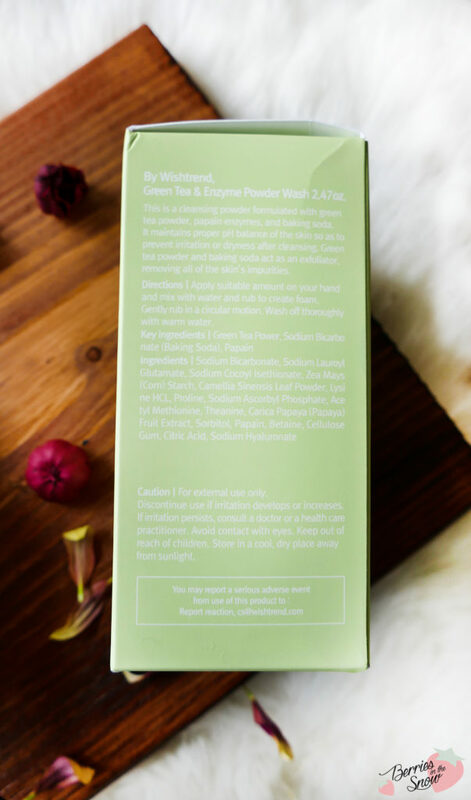 First of all, the By Wishtrend Green Tea & Enzyme Powder Wash smells amazing! It has the scent of fresh matcha tea or matcha latte and just is sooo yummy if you are a green tea lover like me. I feel directly refreshed by the scent when I’m using this cleanser. The foam that is created is not a lot, but only a very watery lather, but on the other hand it is not drying on the skin either. The pH I tested was at 7, but it largely depends on your tap water (or toner) in this case. Regarding it cleansing properties I can recommend it as second step cleanser. It won’t do the work as full makeup remover, so I would use an oil cleanser or balm cleanser to remove my makeup first and then use the powder wash. More often I preferred to use this wash in the mornings as only cleanser though! 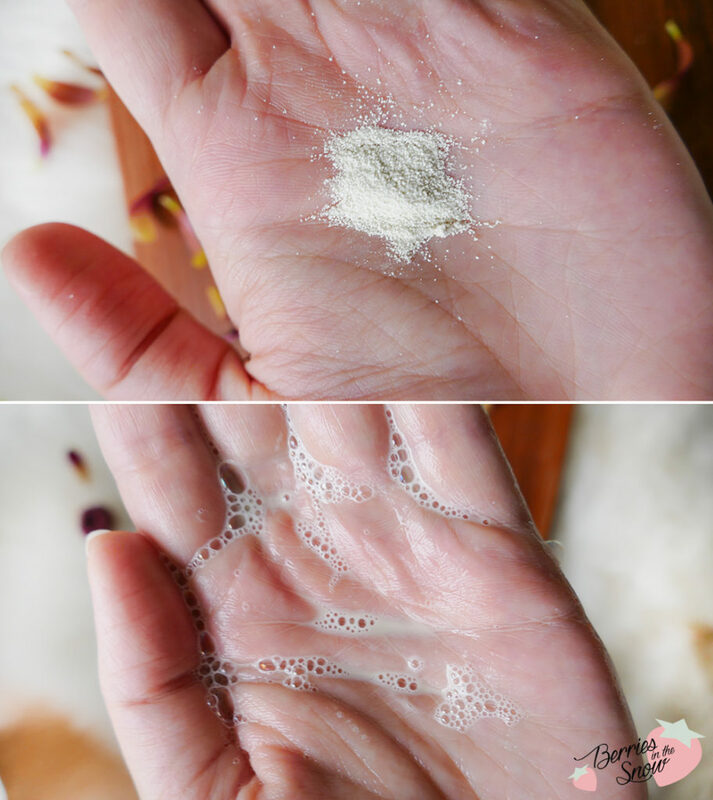 The powder wash will make the skin feel really refreshed, but not dried out. Moreover the skin feels super soft after application and you can feel that it really works with all these exfoliating ingredients. 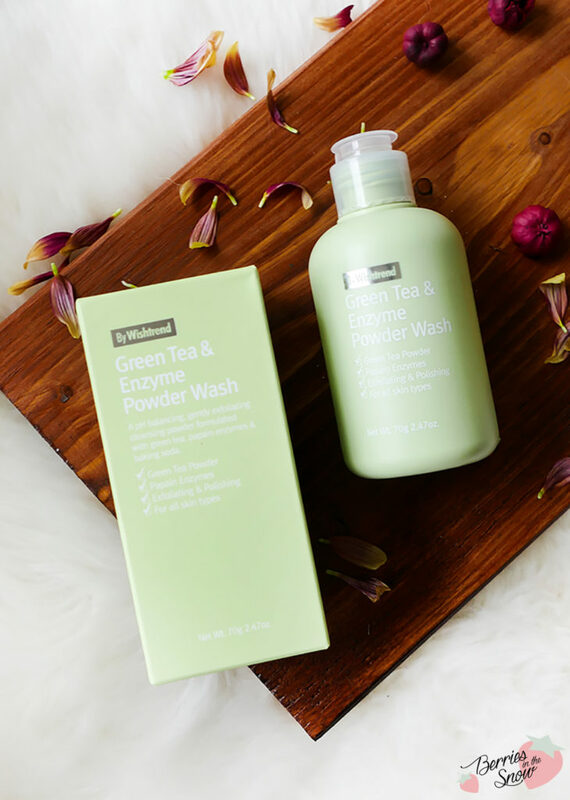 For me the By Wishtrend Green Tea & Enzyme Powder Wash is perfect as once in a while morning cleanser. Usually, I only use water or cleansing water in the mornings. This powder wash adds some nice exfoliating effects and has an amazing scent that makes you feel awake! Since it contains many exfoliating ingredients people with sensitive skin have to try it out slowly, using it only few times in the week. I can imagine that it will act very positively on people with acne prone skin and make the skin feel smoothened out. 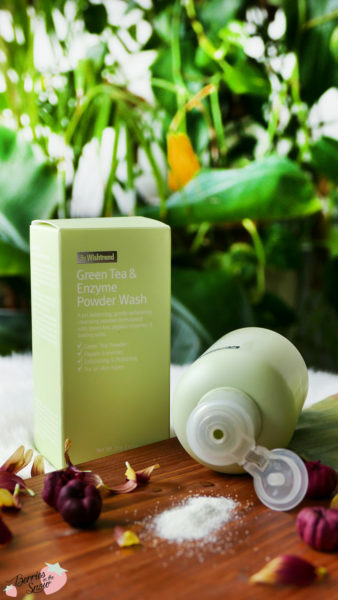 If you are curious about the By Wishtrend Green Tea & Enzyme Powder Wash, too, it usually retails for 22.00 US$ and is available at Wishtrend. But at the moment it is on launching sale until 16th November for only 17.60US$. Keep in mind the friend-referral program from Wishtrend: You can receive a 5 Us$ referral coupon if you use my invitation code 17939205 upon registration and you’ll receive this voucher immediately. There will be a specific field in your registration form called “friends invitation program” where you can put the code mentioned above. This way new customers can safe 5 US$ which is a great possibility to safe some money. Also, Wishtrend has a Free-Shipping Area, were you can find products that can be bought with free shipping. There won’t be any Wishtrend Coupons for this months because of the upcoming Black Friday sales. But there are special prices available for the powder wash in combination with the Vitamin 75 Maximizing Cream and 21.5 Enhancing mask. 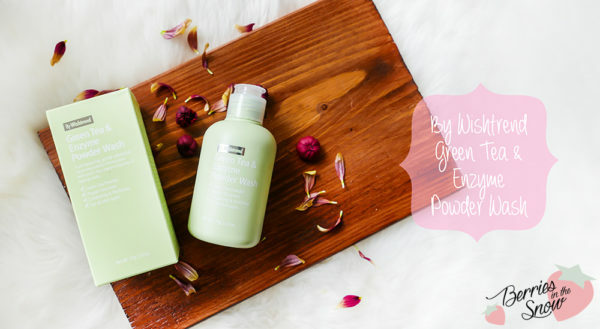 What is your impression on the By Wishtrend Green Tea & Enzyme Powder Wash? Have you tried powder washes before? Eagerly waiting to use this cleanser. I love the smell of Green Tea. That aroma i want to feel when i will washing my face. Thanks for introducing this. This product is so unique! Definitely on my list of things to try. I love Korean cosmetics and beauty products, I always think they are one step ahead. And I absolutely agree with you, I love use powder cleansing products. I’m currently using a powdered exfoliator by Dermalogica and I love it because it exfoliates without being abrasive (using sand etc). Great review, thanks for sharing, will definitely check this out! Oooo I’ve not seen the powder wash ones before and didn’t even know they existed! I need to check them out for sure, I love trying different products so this is going on my list! I love green tea, so I would try anything that has it in its ingredients. I also love K Beauty. Looks like a great product.